As most of us are trying to validate the reasons to upgrade our smartphone to Apple's newest release, there's one man who will be giving the iPhone 6 a $3 million dollar upgrade. High-class designer, Alexander Amosu, is known for bridging the gab between quality and luxury with technology. 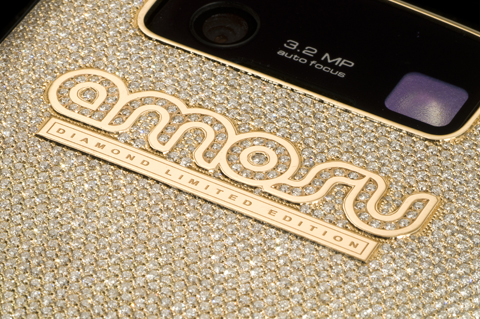 The Diamond iPhone 6 has 6,127 brilliant cut diamonds and a full body in 18 carat gold. The Apple emblem at the back is replaced by a single diamond of 51.29 carat cut to the shape of the logo. It will take Alexander over 2 months to produce the phone, using exquisite hand work. Alexander has called his newest creation "Amosu Call of Diamond iPhone 6" and if you think he won't sell it to a diamond lover, think again. He designed the diamond encrusted iPhone 2, which sold for around $150,000 and the world’s most expensive Blackberry at $200,000 to a mystery client in the Middle East. Alexander spent 350 hours building the custom Blackberry Curve, and it's made of solid 18-carat yellow gold and encrusted with 4,459 brilliant cut diamonds (weighing 28.43 carats), according to the company. Alexander also holds the Guinness World Record for the most expensive suit ($120,000) and most expensive champagne ($1.95 million). If you won't be able to afford the $3 million dollar iPhone 6, you're in luck, because the designer offers a 24-karat yellow or rose gold-plated version (with no diamonds) for about $3,900.